Millet vermicelli or millet semia is available in all stores. Basics and health informations about millets and cooking can be seen here. More millet recipes can be seen here. 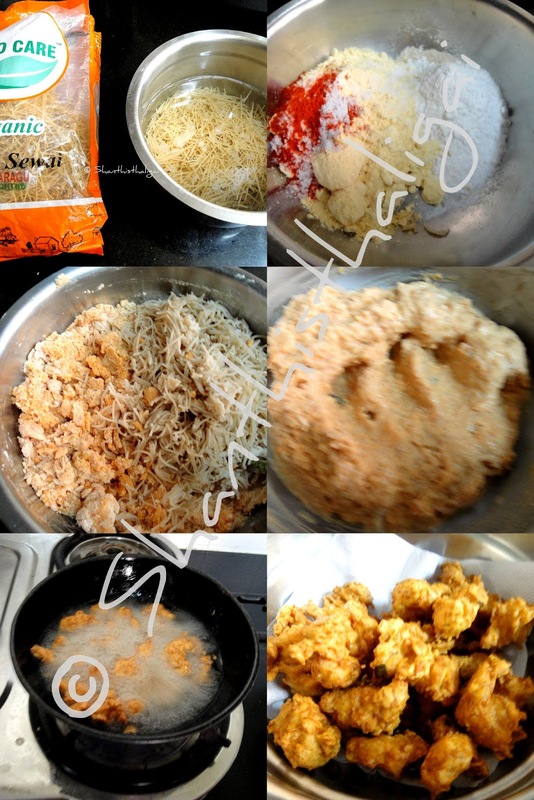 Wash millet sevai well and soak in warm water for 5 minutes. Drain water completely, spread it in a colander. Combine all ingredients. Add drained millet semia, sprinkle little water and mix well to a thick batter. Heat oil. Take a small portion from the batter and drop it gently into the oil. Ensure medium heat of oil and put 7 or 8 in a batch (this depends on how much oil you heat). Deep fry until golden brown. Repeat the procedure with the remaining batter. Serve hot with tomato ketchup or chutney. NOTE: Finely chopped onions, green chillies and coriander leaves can be added if necessary.